Combines several nutrients associated with increasing basal metabolic rate. 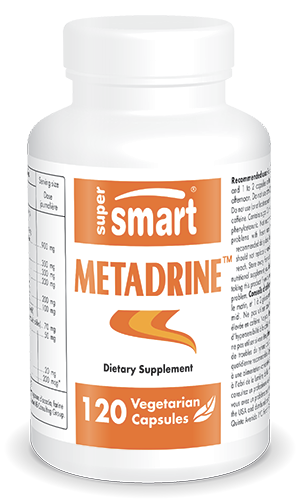 Metadrine™ is a thermogenic formulation combining several nutrients that have been shown specifically to increase basal metabolic rate. Metadrine™ contains a wide range of nutrients that target different and important metabolic pathways: they stimulate the activity of enzymes involved in thermogenic reactions and encourage the use of fat stores which are burned to provide the fuel required for the increase in metabolic rate. - Extract of Theobroma cacao is standardised in theobromine which has stimulant and satiogenic properties. - Supplementing with L-tyrosine helps increase basal metabolism and maintain production of the thyroid gland which can fall during periods of dieting. L-tyrosine is converted into noradrenalin which has an appetite-suppressant effect. - Caffeine has a significant stimulant effect on basal metabolism. It separates lipids, releasing fatty acids which are then burned more easily. .
- Green tea extract accelerates calorie-burning and weight loss. It can increase basal metabolism by up to 4-6%. - Chromium polynicotinate , niacin-bound chromium, helps reduce fat mass and increase lean muscle mass..
- Sinetrol®, a natural extract produced from citrus fruits (blood oranges, grapefruit and lemons) chosen for their high polyphenol content. A clinical study has demonstrated the lipolytic (fat-dissolving) effects of this extract. Sinetrol exerts its lipolytic effect by inhibiting the enzyme cAMP-PDE, and preventing the degradation of cAMP (cyclic adenosine monophosphate). - Capsimax®, an extract of Capsicum annum providing capsicinoids. Studies have shown that it helps control appetite and encourages thermogenesis (particularly by increasing the body's energy output). - Fucoxanthin - the pigment in brown seaweed. Studies show that it stimulates metabolic rate, thus facilitating fat loss. - Super Citrimax®, an extrait of Garcinia cambogia, standardised in hydroxy-citric acid (HCA) with a proven ability to curb appetite, inhibit fat production, increase fat-burning and thus contribute to weight loss. All the ingredients in Metadrine™ work synergistically on basal metabolism to help combat weight gain.